One of the spookiest and scariest places in Missouri. Located about 40 miles south of St. Louis, Blackwell is supposedly the source of very psychic energy. Some people think the town is plain evil. A restaurant called 4-Winds is even rumored to have satanicrituals performed there. On old Blackwell road many apparitions have ben seen. Among them are a phantom couple who flag drivers down for a ride and then disappear. A priest with glowing eyes and a nun who haunts the roof of an old church. Even an older portion of Blackwell Road vanishes when you get close. 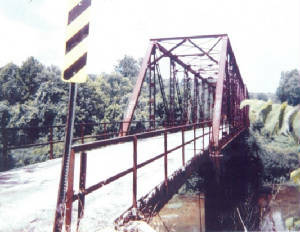 Old Black Tramm Bridge over Big River was built in 1910 was also rumored to be haunted. It is now torn down and a new one has taken its place. It was the general epicenter to most of the spookieness. Drumbeats can be heard coming from under the bridgeand bonfires can be seen glowing underneath. One of the legends goes that if you go on the bridgeand say come get me three times, phantom headlights will chase you away. This is rumored to be the ghost of a young man who wrecked his car and died at the bridge back in the 1980's, There is also reports of a ghost train that flys through the area. It has been seen and not heard and heard and not seen. It has been known to come upon you when you least expect it. Another legend involves a church with a nun sitting on top. This is probably the same nun that was mentioned before. She was raped and murdered in the church and now her spirit haunts it. I'm not sure of her connecton with the priest, but it is rumored he raped and murdered her and possibly took his own life. Nearby is the ruins of the old Mason Hall, which burned down many years ago. Residents speak of an evil entity that haunted it. When they tore down the remains, they carted everything away. Apparently theywanted to be rid of the evil spirit. All thats left is the foundation and people still say the area reeks with evil. I recently traveled there at night and investigated a small abandoned house. As I walked up the steps I was pushed back by some unseen force. A member of the group is was with was also knocked back. At the time this happened, another person with us swore he saw shadows moving in the house.Some of us swore we saw somebody standing by the "dead end" sign across from the house. I'm planning to go back and do some more investigating real soon. If anyone knows about a little girl playing in a cemetery, please let me know. My email address is on my contact page. There are more pictures of Blackwell on the Blackwell photo page.